Tata Power Solar's commitment to change the world has led to the development of internationally acclaimed photovoltaic solar panels which features high efficiency and best-in-class manufacturing edge. Our solar solutions are available to multiple customer segments and our manufacturing expertise provides us the opportunity to build customized solutions. We follow stringent quality checks and extensive characterization of materials to ensure highest solar panel performance and reliability internationally. 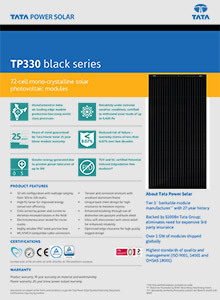 Tata Power Solar is recognized as one of the premium Tier-1 bankable solar panel and module manufacturer internationally. As a leading solar PV modules manufacturer, we follow stringent quality checks and extensive characterization of materials to ensure highest module performance and reliability. Tata Power Solar's PV modules are high on efficiency and has high durability. With a range of configurations, power outputs and module sizes we have worked with large organizations such as TUV, UL. Customer satisfaction is a driving force for Tata Power Solar and we have partnered with a number of large corporations to solve their energy needs. Our solar panels can be installed at international locations that have extreme weather conditions. Our solutions are built to perform, irrespective of the location and weather, through a range of design and functional innovations. Tata Power Solar designs and implements a range of PV solutions. All we need is a rooftop or spare land where we can setup your green power unit. We have provided innovative solutions for a number of clients over the years and are always looking to assist corporations as they look to implement green power solutions. We have completed projects with clients that have strict HSSE requirements and we ensure that our solutions provide backup power without having an adverse effect on the surrounding environment. Tata Power Solar is poised to maintain and enhance its leadership position in providing innovative power solutions. As World's Pioneering Solar Company in the rooftop segment, we have extensive service network Pan India and are changing the way organizations implement power solutions. 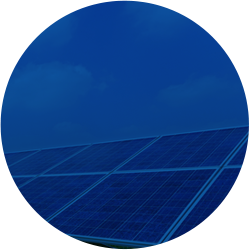 Tata Power Solar has worked with most of the large organizations in the world to provide green energy solutions. From site surveys and installations to lifetime maintenance of the plant, we have an incredible track record in providing power solutions that meet any requirement from an organization.